Phalaenopsis Orchids or 'Moth Orchids' as they are sometimes called have become very fashionable over the last few years and seem to be for sale just about everywhere. The reason for this primarily is the length of time they stay in flower (sometimes three or more months) and the ease of cultivation as an indoor plant. Add to this the hundreds if not thousands of hybrids in numerous colours and sizes and you can see why their popularity has grown. These orchids are found in the wild from the Himalayas throughout the Philippines and on to the wet tropics of northern Australia, up to an altitude of about 300 metres. The majority are epiphytes, loving partial shade and have monopodial growth habits with the flowers appearing on stems that grow from between the leaves. Well that's the history lesson and technical bit over with. What you really want to know is how to keep them alive at home isn't it? They grow in partial shade in the wild so try to re-create this. A window that does not get direct sunlight is ideal. Always a tricky one to explain but I will give it a go... The growing medium should never get completely dry but likewise you should never drown your Phalaenopsis, they hate sitting in water. The best approach is to remove your orchid from it's decorative pot (so it is still in the clear pot it came in). Place it in the sink and pour room temperature water through it avoiding getting the leaves and flowers wet until the plant feels quite a bit heavier again. Allow all the water to drain out before returning it to it's decorative pot. Rain water is very good but tap water will do if you allow it to sit for 24 hours or more, this allows the 'added chemicals' to gas off. 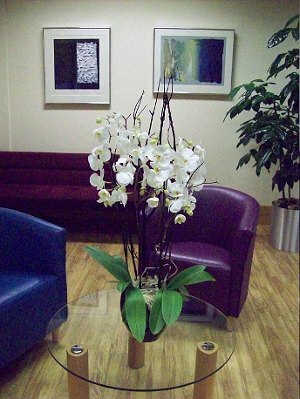 Feed your orchid every third to fourth watering all year round with a weak organic based liquid feed.